What great fun we had today tobogganing down the hills at our local park. There was plenty of snow out, sun shinny brightly, and the temperature was only six below zero. Everything about this day said it was the perfect time to have a bit of fun out doors. This was not Josie’s first time and you could tell; she looked like quit the pro patiently sitting on my husband lap as he pushed himself and Josie for a bit of momentum down the hill. There was no need to hold her down, she was ready. 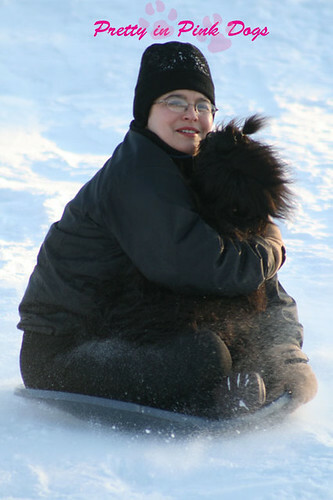 It was Caillee’s first time going tobogganing and see seemed to really enjoy herself coming along for the ride. So Caillee was getting the hang of things after a while. I would sit down on the toboggan and Caillee looked as though she was trying to figure out how to get in as well. That seemed to please me; I think she likes it! Who is that photographer ... he/she has an amazing eye? My husband is the photographer. He was standing at the bottom of the hill taking everyone's photo as they came screaming down the hill. I loved seeing your web site, you have so much fun with your dogs! My Havanese is black, too, but has a white chin and chest. Good luck with the Pretty in Pink team.